Caribou thrive in the far north. How do they deal with the cold, ice, and deep snow? Their thick winter coat has long guard hairs and dense, curly fur underneath. Their feet grow special insulation and form hard surfaces for warmth and traction on ice and snow. In summer, their heavy coat is replaced by lighter fur. 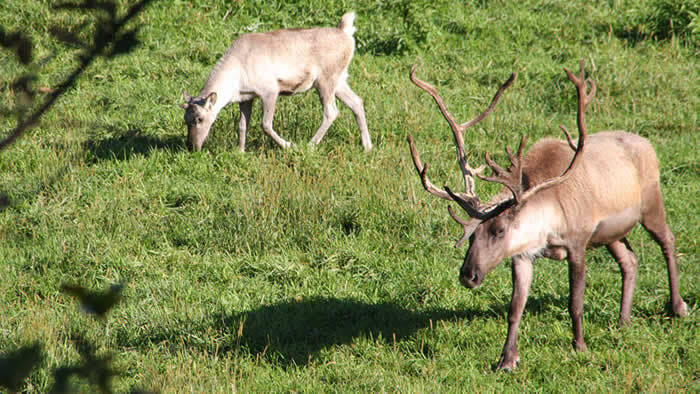 Lichens make up the bulk of the caribou’s winter diet. Other foods include fungi, moss, herbs, sedges, grasses, shrubs, and young trees. Woodland caribou inhabit tundra and boreal forests in Canada, the northern United States, Europe, and Asia. Some caribou roam large areas of open tundra. These herds migrate seasonally to find food. 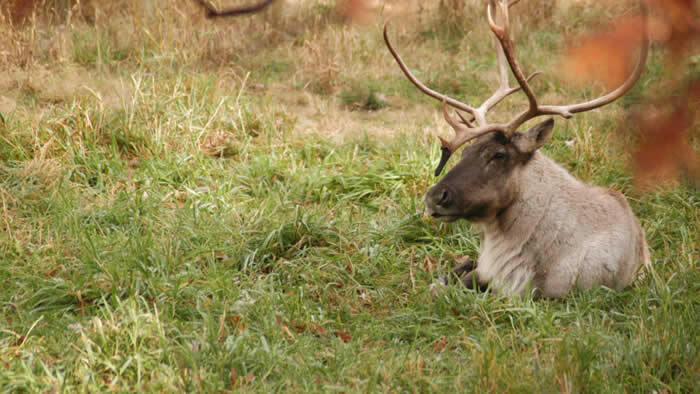 Other caribou live in small family groups and stay close to home in far northern woodlands. They use their massive antlers to protect themselves from predators and find food beneath snow. Males also use their antlers to compete for females. Loss and fragmentation of northern forests and disruption of tundra by development, roads, logging, fossil fuel exploration, and other disturbances have made it increasingly difficult for woodland caribou to find the habitat they need to thrive. Hunting, poaching, and increased wolf predation also have caused a decline in these animals. In Europe caribou are called reindeer. In the United States a small domesticated type of caribou is called a reindeer. These animals have a tendon that clicks when they walk. They use the sound to keep track of each other. Caribou are the only member of the deer family in which both male and females have antlers. Woodland caribou were once found in Minnesota, but they disappeared due to hunting, habitat loss, and disease carried by white-tailed deer as they extended their range. Caribou predators include wolves and bears. 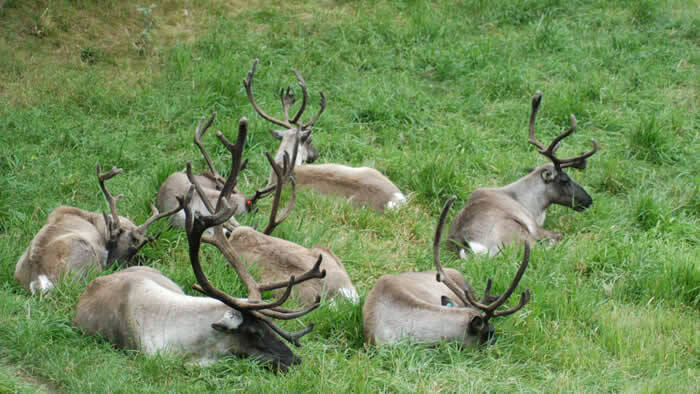 In Europe and the Russian Far East caribou are kept in herds and used for meat, fur, and milk. Tame caribou pull sleighs and carry loads. Caribou were once found throughout northern Minnesota, but populations dropped during the 1800s due to logging, hunting, and the northward expansion of white-tailed deer, which carry a parasitic worm that kills moose and caribou. Logging, coal mining, oil and gas exploration, habitat destruction and fragmentation, wolf predation, hunting, and poaching have all contributed to the decline of caribou in recent years.